Oh man. My eyeballs hurt. Wanna know why?! 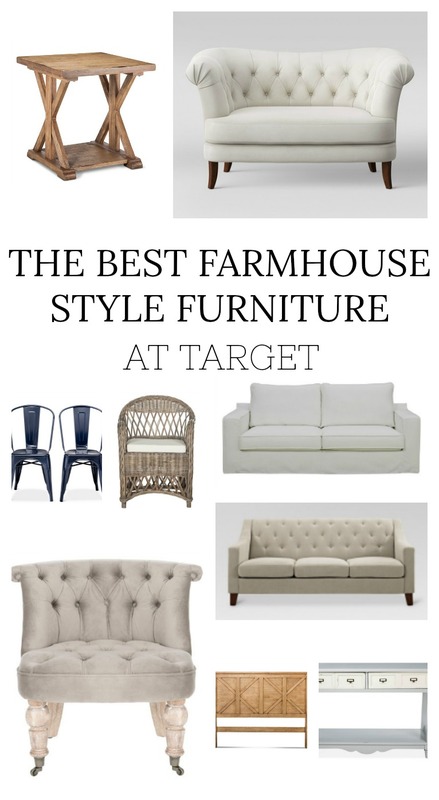 Because for a few hours now I’ve been scouring the Target website searching for the very best farmhouse style furniture. initially intended to do a small round-up of maybe 15 items or so, but the more I looked, the more I found. Then I found some more. And then a little more. Then more. You get it. I basically couldn’t stop looking. And I gotta say, I honestly never realized how much furniture Target offers online. For some reason I’ve always thought of Target as a place for little things like decor, throw pillows, blankets, and accent pieces. I’ve never spent much time browsing their furniture line, but dang–it’s LEGIT. There is tons and tons of great stuff. Plus they do free two-day shipping, which is pretty much the best thing ever. Anyway, I totally planned to post this tomorrow, but I noticed that Target is having a big sale on all their furniture right now through Saturday, so I wanted to get this up now to give you more time to shop! I tried to gather up as many of my favorite finds as I could for you guys. I hope this helps if you’re on the hunt for some affordable furniture for your home. Just click any image below to get more info. And as always thank you SO much for shopping through my blog. Your support makes all this possible! This is so very helpful! Will you be doing something like this but with Ikea? I noticed on your Instagram that you have some items from there and would love to learn how you shop there. So many great farmhouse pieces! Thanks for sharing them, Sarah! Hi Sarah, I am so new to all of this but I soooo love it! Changing from prim to farmhouse is so much fun. Love the brightness and softness of it. Oh I still love a lot of old stuff but I think I can incorporate it house. in with the farm house style. Love the furniture at Target too. I want to go to World Market also. Thanks and have a great day. Hi, Sarah! I checked out this post since I have been casually looking for a headboard for awhile. I’d found one at At Home that I was close to getting. Then I saw the farmhouse style wood one at Target you featured! Not only does it cost less, I like the color better, and it is a little shorter. And best of all it is free shipping! So it arrived today and I can’t wait to have it set up in the master. Thanks so much for this post and helping me shop! Lol! oh yay!! SO glad you ordered that headboard and love it Jo. I was eyeing that one too actually because we need a new headboard in our bedroom. I’m sure it will look amazing in your home!! Oh man, you’re not kidding when you said there’s a ton of stuff out there! I think I put 4 things in my cart! So helpful, thanks for doing all the work Sarah! You’re amazing!